Hope all is well. For those of you who know me, you know I am not only a podcaster, but a musician as well. I own a home studio, play in a band, and I’m currently in the works of finishing up a CD with my recording partner. I’ve been playing and recording (even as in the beginning just to cassette tape) since I was 14. 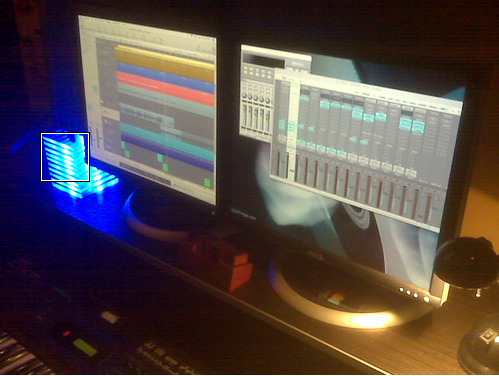 The technology has come a lonnng way and my choice of digital audio workstation is Logic Studio. I’m the kind of person that loves to make use of the many resources out on the internet, especially recording tutorials that reflect not only the kind of equipment I use, but the kind of music I like to record. On YouTube alone, I have collected over 4GB of tutorials on Logic Pro 7 and 8 alone, as well as great user tutorials on the MPC 1000. With that being said, I have found that I have been doing more watching than actual putting to use what I have watched and learned. Enter Quiktraks (60 sec audio). This lil project simply is an attempt to record and upload daily, no more than 60 secs of anything I feel like recording or have recorded: ideas, throwaway tracks, experiments, etc. The tracks are more so to help me use what I have and learn more then simple watching excellent users teach it. In the end, I feel I’ll eventually learn the ins and outs of the tools I use to make music, especially an extremely power digital audio workstation like Logic Studio. – My guitar: Takamine EG-544SC-4C Acoustic. All and any constructive criticism from my recording studio heads are more than welcome! I’d to hear all the technical comments about the mix. This entry was posted in Music Production/Studio Recording and tagged composing, grooves, ideas, Logic Express, Logic Pro, music production, Music Production/Studio Recording, quiktraks. Bookmark the permalink. Aww, what a tease! I was just gettin’ into it….very sic. ::: rezzy – C. what’s up!? Thanks for the comment plan, just a lil sumthin to get me touching the gear every night!